Good morning!! As forecasted, the weather is not looking very hot this morning. "Heavy Rain" is forecasted all day long. This should make my morning commute that much more fun. I forgot to mention in my last post that I was in NY this past weekend running in the Continental Airlines 5th Avenue Mile! I ended up running it in 5 minutes 31 seconds, which is a time I did not expect at all, but still got me pretty pumped. Oh and I can't forget...I also watched the film Mulholland Dr...any of you out there seen it? If you haven't get ready to say to yourself...ok I need to watch that again, because you certainly finish the movie asking yourself um...what the hell just happened? Anyhow, let's get to the topic of today's post. As I wrote about a few days ago, Nokia is launching a series of commercials about their newest phone, the N8. Well to my surprise, Nokia just keeps coming out with content to promote the phone. 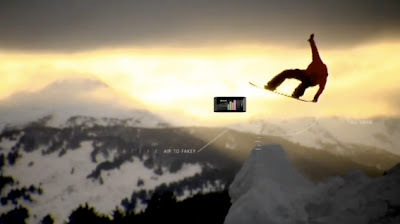 Their most recent video features a partnership between Nokia and Burton Snowboards, and showcases the phone brand's Push technologies to snowboarding. Just last year, Nokia announced the Push Project, and did something similar with skateboarding. It gave skateboarders the ability to score their real life moves as they would in a video game. The same approach applies with snowboarding in that now your able to score your real life moves on the slopes! Certainly sounds pretty cool. I think I need to see the phone first before I say anything! If you want to read more about this particular project, check out the Nokia Push Burton blog otherwise just watch the video! Excеllent, what a ωeb ѕite it iѕ! This webpage gives usеful fаcts to us, keep it uρ.